You'll probably just ride away --- "Mamas Don't Let Your Babies Grow Up to Be Cowboys" was first recorded in 1975 by Ed Bruce, who wrote the song with his wife Patsy Bruce. The song has been covered by many artists, including Willie Nelson. 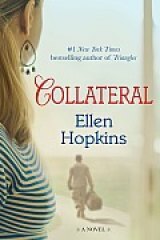 The lyrics of Ed and Patsy Bruce's immortal song echoed through my head as I read "Collateral" (Atria Books, a division of Simon & Schuster, 512 pages, $24.99)) a novel in verse by Ellen Hopkins about military men and the women who love them. Cole Gleason, the handsome young Marine with whom Ashley Patterson falls in love, could have been a cowboy, growing up as he does in Wyoming. Instead he joins the Marine Corps, and is stationed at Camp Pendleton where San Diego State University student Ashley, from Lodi, CA, in the Sierra Foothills of central California met and fell in love with him. Maybe "in lust" would be a better description because Hopkins presents us with very explicit portrayals of their encounters. I've reviewed two previous Ellen Hopkins novels in verse this year -- "Triangles" (my review:http://www.huntingtonnews.net/7356)) and the young adult novel "Tilt" (my review:http://www.huntingtonnews.net/3948)). Hopkins makes verse work very well indeed. It's a remarkable achievement -- as anyone who's attempted to write verse knows. And, for those who worry that verse novels might be more difficult to read, don't worry, be happy! They may be even easier to read than novels written in prose. Ashley and Darian, Ashley's best friend since grade school, meet Cole and and his buddy Spencer in an Oceanside, CA club frequented by Marines from nearby Camp Pendleton and women attracted to them. It's instant lust at first sight for Darian and Spencer, but it's more complicated with Cole and Ashley. Cole doesn’t match the stereotype of the aggressive military man Ashley held; he’s passionate and romantic, and he even writes poetry. Their relationship evolves into a deeply felt, sexually charged love affair that goes on for five years and survives four deployments. Both Cole and Ashley want to marry, and they become engaged. Cracks -- ever so tiny at first, but becoming wider -- appear in their relationship. Taking a poetry course from a handsome, divorced professor shows Ashley what life would be like without Cole. Ashley also learns that Lara, Cole's previous girlfriend, might not be so previous. As their relationship blossoms, jealously and secrets appear between Cole and Ashley. There's a surprising conclusion. No, I'm not giving it away! "Collateral" captures the hearts of the soldiers on the battlefield and the minds of the friends, family, and lovers they leave behind. While those on the home front in the new style wars in the Middle East may be far from the ever-shifting battlefields, suicide bombers and IED's, they, too, sacrifice their lives and happiness for their country at war -- a war that is deeply unpopular. Everybody must eventually ask themselves if the collateral damage it causes is worth the fight. In a prose author's note, Hopkins says her goal in writing "Collateral" was "to put a spotlight on our returning warriors and to hopefully increase interest in providing the resources they need. As more and more return home, the help they require will become harder to find, because of the struggling economy and also because of the growing anti-war sentiment in this country…." "Collateral" occupies a writing niche that will probably attract more novelists who enjoy versification. For now, Ellen Hopkins owns the franchise. 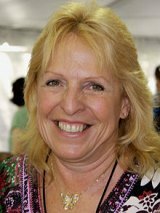 Ellen Hopkins is the The New York Times bestselling author of "Triangles", as well as nine young adult novels, including the "Crank" trilogy and "Tilt", which are beloved by teens and adults alike. She lives in Carson City, Nevada, with her family. Visit her online at www.EllenHopkins.com.